I arrived at the track late for the second year running. A year ago the region was plunged into darkness the night before the weekend started, necessitating a late start for the track; this year, more personal reasons dictated a late start. Those who have read last year's Mosport reporting (still available) will remember a photo of my daughter in the R8; she did what kids do, this year, and it required a Thursday night run to emerge for stitches. She'll be fine. Fortunately, our crowd does not rely on my presence to stake out our territory, and by the time I arrived, they had claimed our usual spot. It was just as well that they had, too; by the end of the weekend, another ALMS-record crowd had passed through the gates, with camping up by about 20%, a reported 70,000-plus taking in a day, and in excess of 40,000 arriving for Sunday alone. This weekend was a very successful one on many fronts, with two Speed World Challenge GT races featuring Ron Fellows, a tremendous Star Mazda race, a predictably entertaining Speed World Challenge TC race, and the ALMS romp. 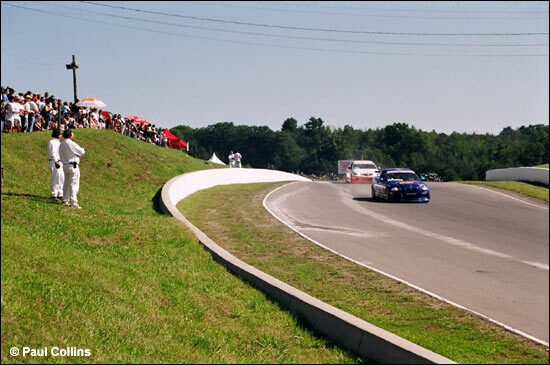 I have to admit that I missed all of the Ontario Touring GT Championship track action, but I heard that was entertaining as well. 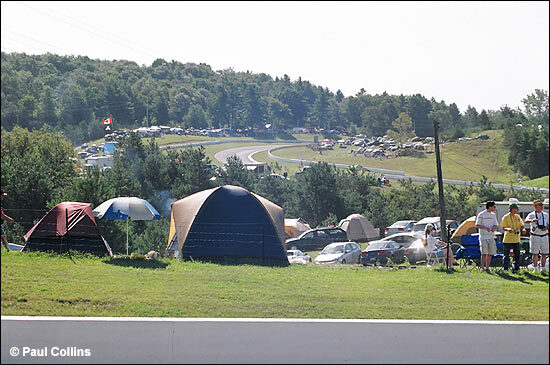 As Mosport continues to build on these events, I can see the attendance will continue to rise. One thing that was apparent was that the hometown perspective was very strong - the autograph session is now handled by each team having their own drivers at their paddock, and the lineups were insane for Ron and Scott Maxwell, and extremely busy for the Dysons as well. It was a real shame that the Lamborghinis withdrew before qualifying, but I can understand the frustration and worry that was felt by team members. You certainly don't want to be out on the track knowing that it's a question of when - not if - a suspension failure is going to occur. It was particularly sad from a local promotion perspective. 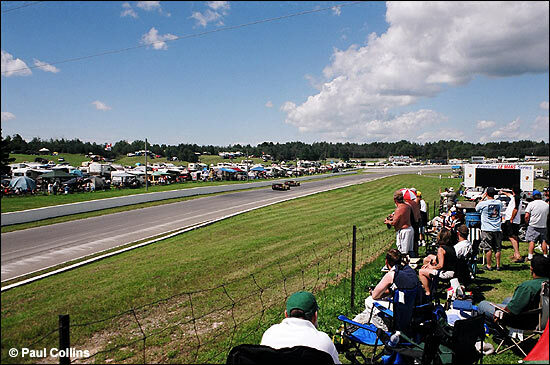 The Mosport posters had featured Ron Fellows and Scott Maxwell prominently (and, as previously mentioned, Scott was one of the favourites for autographs); as well, prior to the race, there were some parade laps done by the attending Corvette Club and Lamborghini Club members. 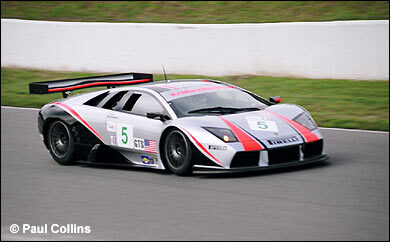 There must have been 25 Lambos, with varying models represented. I’m sure they all felt the disappointment over their team’s withdrawal. Mind you, the suspension wasn't the only thing that kept the cars out, as I'm sure there would have been ways to get the cars strengthened had they really wanted. An engineer friend said "I had a look, and if it were me I would have just welded more steel on the car - but what do I know, I'm just a farmboy." It was interesting to see Don Panoz hanging around his GT paddock - the project clearly has him interested, and I wouldn't be surprised to see more than one out there soon. The chassis they were running (the fourth built) will apparently be replaced soon, and the seventh should be done in time for Sebring. On the track, there were a few things that caught our eye consistently, and a few things that we noticed. 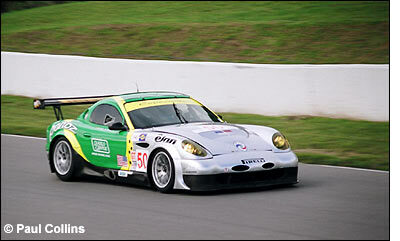 The Panoz clearly has speed, and was even briefly at the head of GT. In the end, for qualifying, they ended up sixth, but notice who was ahead: two Job Porsches, two Lizards and the Petersen/White Lightning entry. They're on the tail of the cream of GT. However, come the race, they were running the softer Pirelli tires, and then lost their hood - which would have reduced their front downforce. It was apparent that the tires were going off toward the end of David Saelen's opening stint, and the Panoz dropped off after about 30 laps. In the long run, these tires will improve - testing and development will be required, but the team seems up to the challenge. Speaking of tires, this was the first weekend for PK to be running Yokohama customer tires, and they have to be somewhat satisfied that they were able to keep on the pace. It was apparent that Piers Masarati was having to fight the car, and he put up a mighty battle for the first 20 minutes, keeping putatively faster cars like Tim Sugden's behind him, before finally being eclipsed. How much of the performance difference was due to the tires, and how much was due to running an RS in a field of RSRs wasn't immediately apparent, but Mike Pickup is a man of ambition, so I wouldn't expect PK to settle for their current position for long (although frustratingly, the team won’t be at Road America). It's funny how the regular world and the racing world can have completely different views of similar issues. One of the members of our group works for MTO (Ministry of Transport) in pavement maintenance, and so we would spend some time looking at the pavement and transitions each evening during our track walk. We were amazed at the way the track seemed to be pulling apart, with small spalling gaps opening up, and the edges of the portland concrete in the corners starting to separate from the asphalt. It's clear that pavement technology has not kept pace with tire development, as this pavement is less than four years old. Our assessment was that local (washed) sand and gravel may have been used, instead of crushed rock, and that it was not angular enough, therefore the particles were able to slip past each other when laterally loaded (either from tires pushing through corners or at acceleration and braking zones). The use of this material also means that the pavement would not have as much grip as one made of crushed stone, and therefore should not wear as much. Yet the race was decided on the issue of tire wear, as the Champion Michelins could not last more than one stint. So tire development now allows cars to tear up roads that ten years ago might have withstood the punishment, and the added stress on the tires from this grip means that they, too, lose their viability more quickly. It's always good to hear the shriek of a Judd engine amongst the thunder of the big boys and the breathy note of the turbos - at least in Clint's car. Jon may be happy to have his B160 repaired, but his engine was not sounding healthy all weekend. During the race, the difference was apparent, as Clint was even able to shadow Jon for a number of laps, despite the lighter and better handling chassis under Jon (although perhaps it wasn't better handling at the time?). The old SR2 chassis looks much more dramatic on the track with a 3.4 in it than when it had less power, and Clint and Robin were entertaining wherever we saw them. Here's to hoping that Robin is able to run out the streak, even if it means 7 wins in 9 races and still no championship. 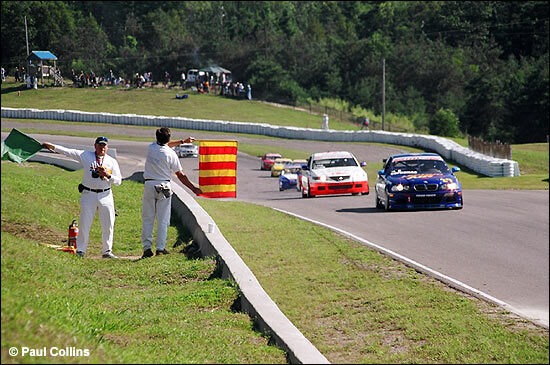 The last thing I'll mention is the evolution of spectating at a road course. Last year was the inaugural year for iCards at the track; for some reason, Customs Canada decided to hold up the iCards at the border this year, and so we were unable to rent the handy little devices. In the meantime, the ALMS was trying out wireless computing trackside, and we had one computer at our campsite that was capable. Unfortunately, timing and scoring has also been intermittent this year over the web, and so the usefulness of the laptop was diminished. The screens that have been a fixture of the series for the last few years have improved greatly each year, and now have video capability. Unfortunately, with the gain of live video feeds, the data has now dropped off considerably, and now we aren't given lap times at any point. This absence was particularly evident during qualifying, as we had no sense of what times the lead cars were going for, and how close they were to it. This would not have been much of an issue, if the internet timing and scoring (I hesitate to associate the word "live" with the data as presented) or the iCards had've been available. But since they weren't, the screens were not very useful for qualifying, and the qualifying itself seemed very anticlimactic. The exact opposite problem is associated with the screens during the race, as the presentation of the exciting battles at the front all around the track would encourage us to watch the screens almost to the exclusion of the other action immediately in front of us. The amount of entertaining action available to us during the race was very high; the ability to watch the pit stops as they happened told us immediately of Champion's gamble, and we knew right away that, with JJ slithering through 8 and locking up in 9 before the pitstop, they had erred. Putting our stopwatches on the gap back to Butch when JJ rejoined, we were able to anticipate Butch catching JJ within about 20 minutes of the pitstop - but ten minutes later, JJ had his blowout, and the race was settled. Again, we would have known about twenty seconds later without the screens, but we saw JJ in the tires at Moss corner live, and it added to our enjoyment of the event. All in all, it was an interesting mix of old (stopwatches, programs, cameras and eyes) and new (internet, dailysportscar on site, video and data screens) in our weekend. It will be interesting to see how the facilities will evolve in the future, and the ALMS seems committed to pushing for dramatic improvement of the trackside experience. I welcome the results, and applaud the effort.